My concern with the AIM dataset was that it was too small and specialized to support broad conclusions, but it turns out that the AIM data sit somewhere in the middle of the disciplines analysed. 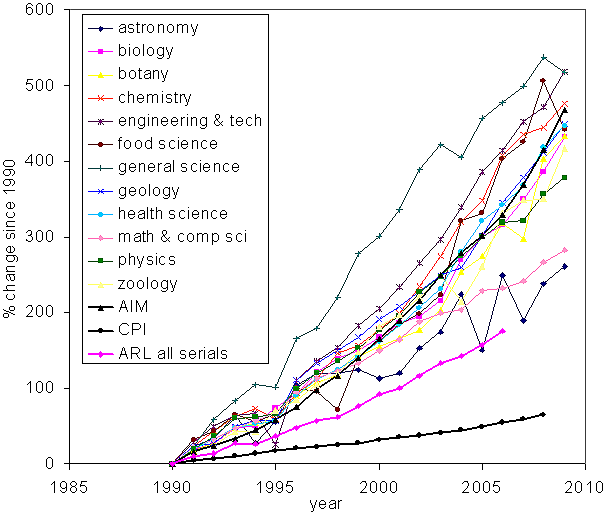 Astronomy is closest to the ARL all serials median, with math and computer science not much worse; general science is the worst offender, with engineering and technology, chemistry and food science not far behind. From 1990 to 2008, total price increases ranged from 238% (astronomy) to 537% (general science); that’s 3.7 and 8.3 times the increase in the CPI, respectively. This dataset covers an average of around 3600 journals from 2005-2009, 3255 from 1997-2001 and 2655 from 1989-1990. I think this represents good evidence that historical price data for total serials, even though it shows a rate of increase far greater than that of the CPI, masks an even greater rate of increase among scholarly (scientific) journals. It’s difficult to look at that graph and believe that scholarly publishers are playing fair, particularly when one remembers that online publishing, with its attendant cost reductions, came of age during the same period of time. The Van Orsdel/Born surveys include a number of other scholarly disciplines (art, architecture, business, history, language, law, music, etc etc). If I have the time I’ll work those up as well, to provide as broad a picture as possible. I should also include numbers of titles in each discipline, to give some idea of total influence. For instance: although general science (around 60 or 70 titles) shows the greatest increase, it likely contributes far less to the serials crisis than health sciences (more than 1500 titles). Interesting graph… Can this be the reason with having too many journals? If we assume the production cost has not so much grown, has the number of paying reader going down? Would make sense since libraries have been cancelling publications for quite a while now… or would that not explain the difference in price growth? It also reminded me that I used to contact the author for a reprint when we did not have a subscription to the journal… with todays communication, why has this not taken a prominent place in todays publishing? Who cares about journal prices; just cancel them and request reprints for that paper you need every now and then? I mean, you can buy the paper online with the publisher, so maybe we have forgotten how to email to corresponding author? Journals face ~5% loss of subscriptions every year — they call it “attrition”. Because their market is inelastic, they simply deal with this by raising prices. One of the points I didn’t really bring out here is that to compare “exactly like with exactly like” you would use the library data to look at unit serial costs instead of total serials expenditure (see the post before this one). I didn’t do it because the unit cost curve starts dropping after 2000 — this makes the comparison seem even more dramatic but there’s a facile explanation: that was right around the time in which publishers started bundling journals extensively and libraries started rebelling and cancelling bucketloads of overpriced journals. So the short answer is yes, I think all of this does have something to do with the proliferation of journal titles: one of the ways publishers cope with the situation I just outlined is to create stables of specialist journals. NPG is a good example, with Nature establishing the brand/reputation and about 40 “second-tier” (their term, not mine!) journals. Regarding reprints — I think the standard reply to that question is that if we all cancelled the subscriptions and wrote for reprints, there’d soon be no journals to publish in and so no reprints either. That doesn’t seem like a necessarily bad thing to me — see, e.g. Bjoern Brembs’ ideas about creating a single Virtual Journal, really a preprint archive, and contracting out the peer review as a second layer on top of that.